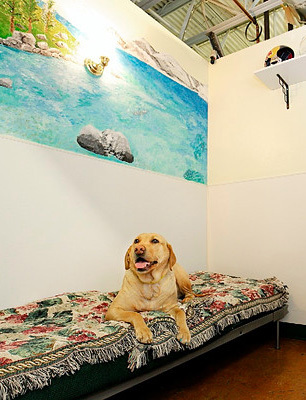 Bring your pet to Truckee-Tahoe Pet Lodge for his or her first boarding stay, mention this offer and receive 50% off your entire stay with the purchase of an activity package. Must purchase a Premium Activity Package (Silver, Olympian or Gold). Discount subject to availability and cannot be combined with any other offers. Discount applies to base overnight lodging rates only and does not include other services. This discount is limited to a maximum of 10 boarded nights. It is not available for the following days: November 20-30, and December 19 – January 4th. The 50% off special requires a one time $10 donation to the Humane Society of Truckee-Tahoe. The donation can be included on your bill as a tax deductible charge when you check out. Advance reservations and current vaccinations are required. Please identify yourself as a first time customer at the time the reservation is made. Call (530) 582-7268 to Book Your First Stay! Be Sure to Mention This Offer!